Aeon Toys--All Hand Made from Wood! Please contact directly at ralbuck@yahoo.com --- as contact form does not always work! Please contact DIRECTLY email to ralbuck@yahoo.com contact form does not always work! Rocking horses, cars, trucks, tractors, ornaments, name trains, special trains, name plates/letters and almost anything you want hand made from wood-- Absolutely no "clones"
I now have cribbage boards and even DRAGONS to guard the playroom. I now also have beverage haulers available for several different sizes of bottled liquids! Openers too. Built light, but still strong enough to work well. YOUR --IDEAS --for new products or website changes are always very welcome! Please use email contact! Thank You! Aeon Toys are all hand made by me Ralph Roggenbuck now from Aloha, OR. Formerly Fargo, ND. I have made wooden nick-knacks, lawn ornaments and other wooden things for 60+ years. I enjoy building them to suit YOUR Pleasure! 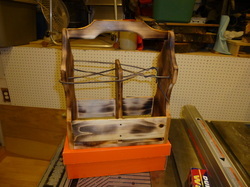 I re-cycle wood on some things; and use child-safe finishes on all toys. On the Outdoor things I use EXTERIOR finishes! Everything I make has a replace/repair within 1 year, my option warranty! I stand 1 way shipping also! Any of my toys; as any OTHER TOYS do need full-time ADULT SUPERVISION--That is the CHILDREN while playing with toys! The TOYS do behave well when left alone!